How do I write mathematical equations? You can use either handwriting recognition or our maths toolbar to write maths equations. 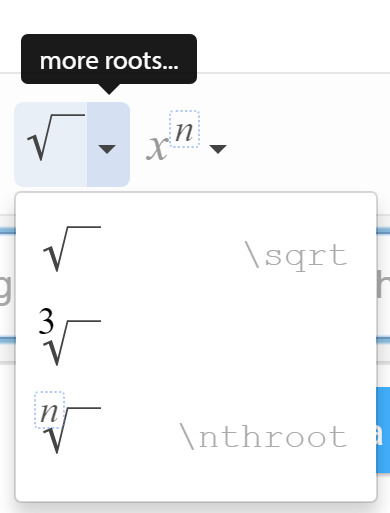 The Maths input toolbar makes it easy to add operators to equations like exponents, square roots, fractions, Greek letters and more. You can type numbers and algebraic variables (e.g.X) using your keyboard. Click the down arrow to see different versions of operators. For example, cube or nth roots, along with their shortcut codes. Click anything on the toolbar to insert it into your equation, then type into the gaps. The maths toolbar has a number of different keyboard shortcuts you can use to input different mathematical operators. You can type these instead of selecting them in the toolbar. For example, the * key works in place of multiplication and the command \sqrt works in place of a square root. You can hover your mouse over the operator to see it's shortcut code. On touchscreen devices, you can use handwriting recognition. Write your equation on the grid and it will be automatically recognised and converted to text. Click Use handwriting or Use keyboard to change between the two input modes. If you're having trouble with writing mathematical equations, contact our Support Team at support@educationperfect.com, and someone will be able to help you out from there.